Features three levels of fun. Chew proof and mess resistant. Quick and easy assembly. 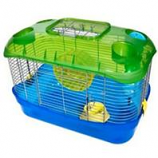 . .
• 1/2 Horizontal Wire Spacing Allows Pets To Fulfill Their Instinct To Climb and Explore In Secure Environment. • Full Width Double Doors Provide Maximum Accessibility For Easy Cleaning and Feeding. • Wide Expanse Shelf and Full Width Plastic Pan Floor Provide Maximum Play Area and Prevent Dangerous Falls. 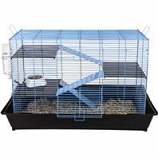 • Swing-Up Locking Ramp Secure Sections For Cleaning Cage, Feeding and Separating Pets. • Critter-Proof Dual-Locking Door Latches Provide Secure, Easy One-Hand Operation. • Quality Nylon Canvas, Scratch Proof Screen and Premium Quality Zippers.